Tenant Association demands that their landlord Cornell Realty replace their broken front door, and install a security camera! We the community stand with the tenants of 501 Lefferts Avenue, represented by the 501 Lefferts Tenant Association and their demand that their landlord, Cornell Realty, replace the front door, install a security camera and fix the intercom system! 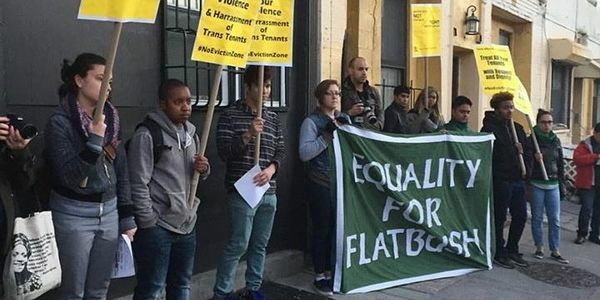 Tenants of 501 Lefferts Ave , which is owned by Isaac Hager of Cornell Realty Management, one of the largest developers in New York City, have reported that the front door of their apartment building is old and broken which poses a security risk for the residents. Residents of 501 Lefferts Ave have already been the victims of violence in their own building and deserve to feel safe in their home. As the owner, Isaac Hager is responsible for making sure that this building is secure for tenants. That's why tenants are demanding that Isaac Hager (1) replace the broken door with a new door that is secure; and (2) install a security camera and a functional intercom system.These changes will reduce security risks, give residents more control over their home and the peace of mind they deserve! Call 718-942-9191 to demand Isaac Hager and Cornell Realty replace the front door and install a security camera and intercom!